Posted on January 13, 2009 by Jian Akiraceo. This entry was posted in Ofix. Bookmark the permalink. Reply: Hahaha go wear two fake ears on your head..
YOu can put her into ur comic series next time. Reply: She do have a name XD.. Reply: Her mood was always good 1.. and very kind..
Last time she always fetch me back home when I don’t have a car yet..
Ehh what do you mean by good at acting? Reply: Lol.. dunno ler.. maybe cincai draw gua..
hahaha the angel ring is so cute! you really splash that drink ON her FACE? Reply: No lar.. only on her shirt and pants.. 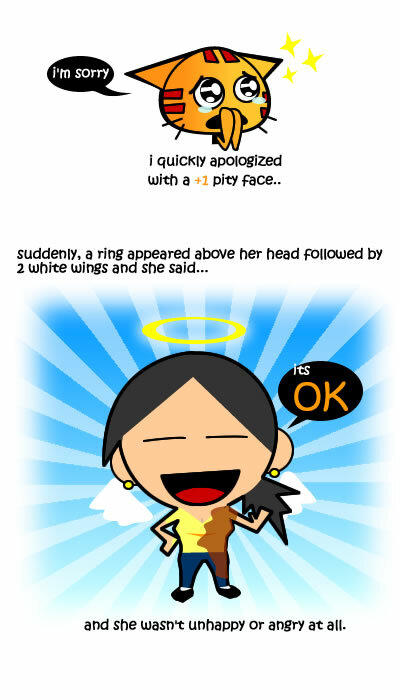 Reply: Remove the +1 pity face part..and the angel’s ring and wings..
Luckily your colleague is really an angel. Or else we’ll be eating Claypot Miao. HAHAHA! OMG!! +1 so cat-ie cute!! Humzz.. milo miao!! wah kekekekez.. Reply: It have been a long time since I play firecrackers lur… so I think its still okay. XD +1 cuteness? If +100, how will miao look like? Reply: Thank you thank you.. I will go fixed it.. I actually bad in acting.. I even act in a short drama for a project during my university.. XD I was soo bad..
NICE DRAWINGS! TWO THUMBS UP!!!!!!!!!!!!!!!!!!!!!!!!!!!!!!!!!!!!!!!!!!!!!!!!!!!!!!!!!!!!!!!!!!!!!!!!!!!!!!!!!!!!!!!!!!!!!!!!!!!!!!!!!!!!!!!!!!!!!!!!!!!!!!!!!!!!!!!!!!!!!!!!!!!! Damn, I opened both entry page. >_< Tercomment wrong page!